While the Boston Crème, jelly-filled and glazed ring donuts fly out the door at the Dunkin’ Donuts in St. Joseph, Missouri, cups of fresh brewed coffee are still a slow seller. It’s the ongoing challenge for franchisee Dave Riggs, who opened the restaurant in 2012. “Making Midwest customers more aware of the high quality of the beverages we offer is the hurdle I face – and Dunkin’ Brands faces – as they expand westward,” says Riggs, a longtime businessman and Missouri native who is proud of being a local owner in this quiet community located on the Missouri River. Although Dunkin’ is primarily known as a coffee shop in the Northeast, donuts are more of a draw in the Midwest, says Riggs. Riggs runs the Dunkin’ Donuts at 1206 N. Belt Highway and admits things are off to a smooth start, even though his sales mix still weighs heavily in favor of baked goods. Located on a busy commercial thoroughfare between a Walgreens and Burger King, the restaurant is a major upgrade from what St. Joseph previously had—an old-fashioned, 1970’s era donut shop with no drive-thru. That location – St. Joseph’s only Dunkin’ – closed three years ago. “We saw an opportunity to buy the license and change it into a modern-day Dunkin’ Donuts,” says Riggs, who flew out to Boston, visited different Dunkin’ locations and talked with various franchisees and managers before returning to Missouri for his grand opening. He felt a re-energized Dunkin’ Donuts – open 24 hours – would do well in St. Joseph. There were few coffee and donut shops in town, none with expanded hours and none offering the product mix of his Dunkin’. The local Starbucks was popular but Riggs felt the Dunkin’ coffee program was a competitive offering. “Dunkin’ is a professional, well-run franchise organization,” says Riggs, who also owns a tanning salon and an Arby’s, and has run other local businesses including a full-service restaurant and nightclub. After the previous franchisee shuttered his Dunkin’ Donuts shop, Riggs scouted a location near the busiest intersection in town; the small parcel of ground was one of the few undeveloped sites in this retail district. Space was limited, but it was enough for Riggs and his business partners to build a bright, attractive restaurant with a drive-thru and tables with 30 seats—including comfortable, soft-seating. 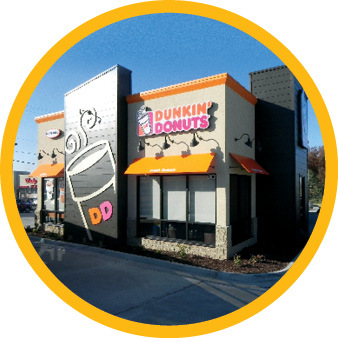 With its colorful orange awnings and eye-catching exterior graphics showing a steaming, tantalizing cup of joe, Riggs says his Dunkin’ Donuts fits right in. Since Riggs’ Dunkin’ opened in November 2012, the business climate has improved in Missouri and customers have been streaming through the doors. The cash register rings steadily until noon. Beverage sales are growing, and sandwich sales are consistent. But it’s still the donuts (and munchkins) that bring home the bacon—in excess of 50 percent of sales. “We are probably the munchkin king of Dunkin’ Donuts,” jokes Riggs. Customers love munchkins for kids’ birthday parties, soccer games, cookouts and family get-togethers and Riggs carries a wide variety. 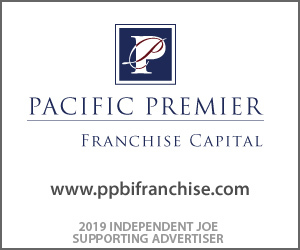 Franchisees in the Missouri, Kansas, Iowa, Nebraska district have a goal to increase beverages to 40 percent of sales. Riggs says his number is in the mid-30s. “It’s not like the East coast, where 50-60 percent of sales is beverages.” Riggs says educating people that “we have coffee, too is a chore we have to accomplish, but it’s tough.” He’s advertising aggressively and offering various promotions designed to get new coffee customers in the door. Riggs has owned his Arby’s Roast Beef franchise since 1984 and believes the keys to being successful in the quick service industry are the same from concept to concept. “Fast, friendly, accurate customer service is the primary key to success,” says Riggs. “If customers completely enjoy their visit, they will come back more often and tell others about their positive experience.” He keeps a close eye on food costs and labor, trying to manage hours without sacrificing service. “Those are the two largest costs to restaurants and the ones you have the most control over,” says Riggs. His franchise agreement calls for developing three units in the area and Riggs is also looking into other nearby cities, but in the meantime, this new Dunkin’ franchisee is proud of his St. Joseph shop. He is quick to tell you that Dunkin’ will succeed here, but he’s not so quick to admit he doesn’t even drink coffee. “I do like the vanilla chai, though,” he says.